Why pay costly health club memberships when you can get a total body workout in your home? You will save save hundreds building your own Home Multi Gym from common materials. This is the best collection of design blueprints for building your own weight training equipment. These simplified design plans allow you to make your own equipment just from wood. The bill of materials tells you exactly how many, and what size pieces there are. The lumber and materials can be purchased at any building supply store or lumber yard. No welding, easy detailed gym designs, lets you perform almost any exercise including: bench press, squat, T- bar row, low cable row, standing calf raise, lat pulldowns, tricep pushdowns, standing cable flyes, partial deadlifts, cable abdominal crunches, cable side laterals, hanging leg raises, chin ups, cable bicep curls, bent over cable laterals, incline bench press, and much more! Also the built in safety bars eliminate need for spotter. 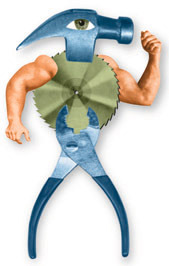 Basic woodworking tools is the only other thing required to create your own home gym. The fully detailed designs includes diagrams and drawings. Construction is simple and quick, no special skills required, can be built for a fraction of the cost of commercial home gyms and does much more! Or would you rather get the electronic download version of the plans? Since I do not have to pay for printing and mailing costs I can offer the plans to you at half price. Only $15.00! The e-book is in Adobe PDF format, so you must have Adobe Acrobat Viewer to read and print the file. Adobe Acrobat is a free program that you can download by clicking on the icon below.